Your Active Directory account password should be treated as though it is essentially a padlock securing sensitive information. One of the most frustrating aspects of being in the IT team is having to constantly deal with routine password resets, password exposure threats and bad user passwords. Having passwords expire at regular intervals is standard practice when it comes to securing the IT infrastructure. IT teams should encourage stringent adherence to regular password resets and educate their users about the dangers of not regularly resetting them. Loss in productivity, constant calls to help-desk technicians, financial losses due to downtime and account lockouts are some of the many issues which can arise from expired passwords. In essence, this means that installing a password expiration reminder solution could play an important part of mitigating the risks of such events. 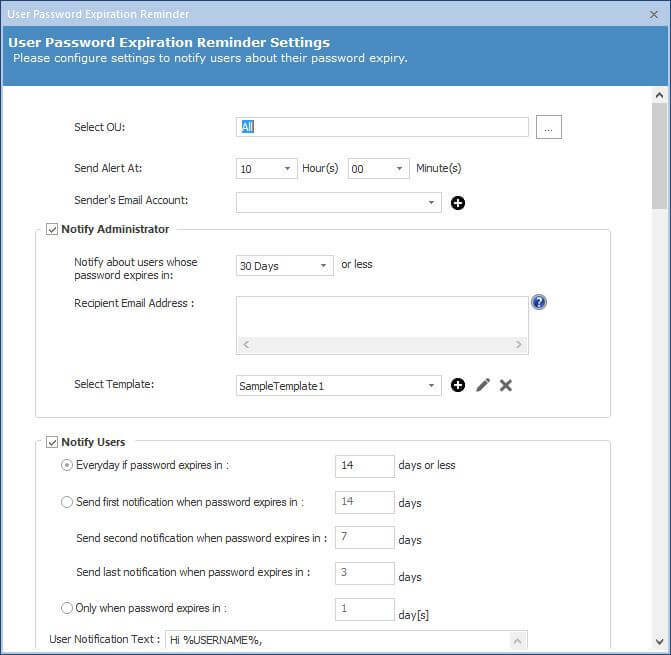 Lepide User Password Expiration Reminder is an inbuilt component of LepideAuditor, which is capable of tracking users with soon to expire passwords and sending email notifications to them. However, this component has to be configured first. Once configured, the solution provides the granular details on status of passwords and allows you to notify the concerned users, administrators, and technicians in real-time. Admins or concerned IT personnel can set a reverse countdown notification informing users about the number of days in which their passwords would expire. You may have users that use their Active Directory credentials to access connected servers or applications, but do not directly logon at computers. In such cases, password expiry reminders would not be received, so LepideAuditor would be useful. Notifications are sent via email at user-selected intervals. In cases where users can’t take immediate action, follow up email alerts can be sent automatically. 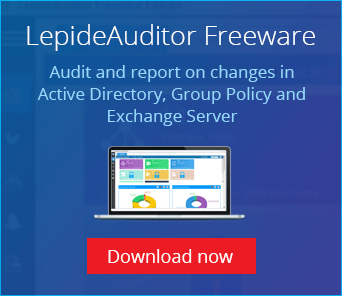 You will no longer need to actively remind users to change passwords, as LepideAuditor can send numerous notifications automatically. Users will find it very hard to miss password resets with frequent notifications. You will have complete control over who receives alerts and how those alerts are received through the filtering capabilities of the solution. Guide your users automatically with customizable email notification content. 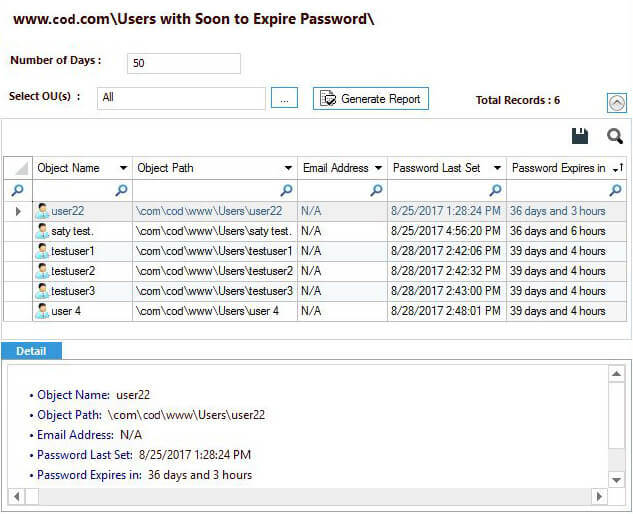 Users with soon to expire passwords: This report displays important information; such as object name, last set date of current password and the number of days in which the current password would expire. Such reports help admins take the necessary steps towards reminding users of password expiry. Users with expired passwords: This report gives you an overall summary of the object name, email ID, the date on which current password was set and date on which current password expires. Users whose password never expires: This summary report collates details like object name, email ID, the day on which current password was set and days since this password was set. Password change reports: You can track and analyze changed passwords with this report. It shows details like object name, email address, the date on which the last password was set and days after the current password was set. Users needing to change their password at next logon: This report gives you a list of users who are going to need to change their passwords at next logon. Recent logon failures: This concise report provides details like object name, email address, the day on which logon failed and day on which the current password was set. If you want an easier, more automated way to send the interactive password expiry notifications, User Password Reminder module of LepideAuditor is crafted for you.